I'm so upset due to the terror attacks in Oslo and Norway today. It's absolutely unbelievable that something like this can happen, and frankly, it feels rather close to home. So I'm watching CNN and Norwegian television, and snacking, a lot. And that brings me to Blogging By Mail, a wonderful event organized by Stephanie where bloggers around the world send each other packages. I got mine from sweet Esme at Chocolate & Croissants, who went a little crazy at Trader Joe's! 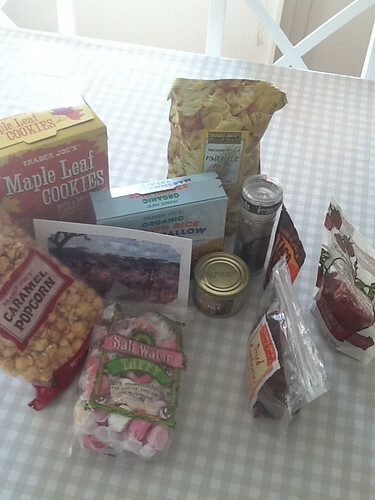 I got all sorts of goodies - brown rice crispy treats, salt water taffy, maple cookies, sun-dried tomatoes, dried cranberries, pineapple chips, caramel popcorn, roasted green chilies, taco mix and a grinder with coffee, chocolate and sugar. Amazing. And such good timing, because on days like these, you appreciate the good people of the world even more. Thank you Esme, thank you Stephanie. And thank you, all my friends from all over the world. I'm so happy you exist, and I hope you are safe and sound and will never be touched by horrendous events. Anne, I was in absolute shock about the news-Oslo-those poor innocent people. I am glad that you enjoyed your package-and glad to see it did not take it long to arrive. PS when did your wishlist go up-I did not see it when I visited your blog? The attacks in Norway are very distressing and shocking! I feel for all those innocent people whose lives were taken by this violence and pray for the families whose lives will never be the same. The people of Norway are in our prayers!! Hi,Anne, and everybody here. Here in Minnesota, USA, people are very upset over this, as they have strong Norwegian roots. More than that, I see so many people trying to blame this person's agenda on groups. I don't want to do that. Labels, names, religion, politics, whatever. They are too often used to separate us from our humanity. As an answer, I've decided to investigate the crafts of other countries, because I feel crafts, food, children, those are some of our commonalities, and they connect us to the spiritual and our humanity. I want to start with Swedish and Irish crafts, as those are my family's roots. If anybody here can suggest a few good sites for Swedish crafts, I would appreciate it if you would email them to me at my email address, Olsonmiki@gmail.com. Thanks! It's Stephanie, not Jennifer, who writes Dispensing Happiness and organises Blogging by Mail. Oh OF COURSE - I can't believe I got that wrong!